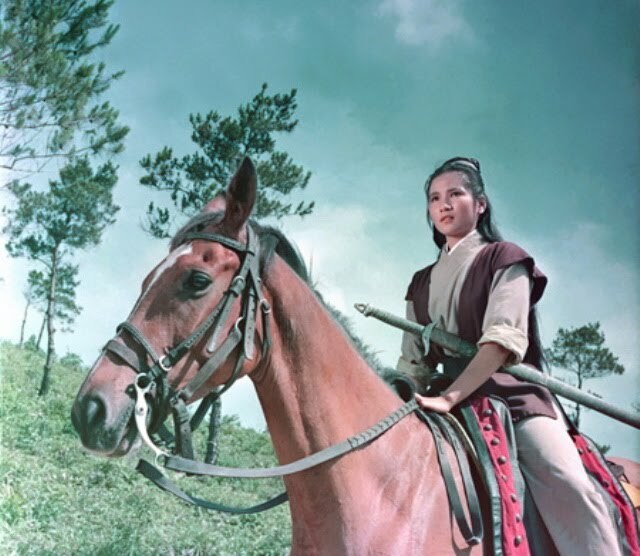 An exciting pre-credits sequence gets 1970's Lady of Steel off to a grand start as Wong Chung Shun and his gang ambush convoy members who are resting at an inn. The survivor of the raid and subsequent fire is Ying Qi, the infant daughter of one of the victims. When grown, Ying Qi will be played by Cheng Pei-Pei. Let the slicing-and-dicing begin! 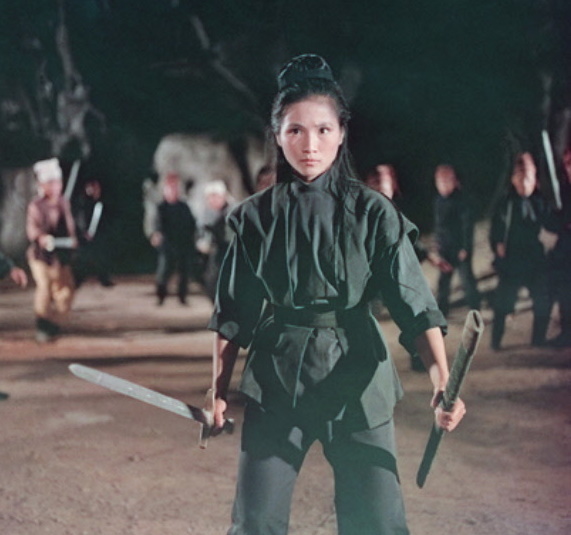 After those pesky credits, we finally see Ying Qi (Cheng Pei-Pei) being trained by Goo Man Chung who counsels the girl to wait for her revenge as the Jins are invading the country. The girl is sent off with a letter for Da Kun mountain. At another inn, Yueh Hua enters and he appears to be a beggar. He gets a rough treatment by the inn keeper until he flashes some pieces of gold at the guy. 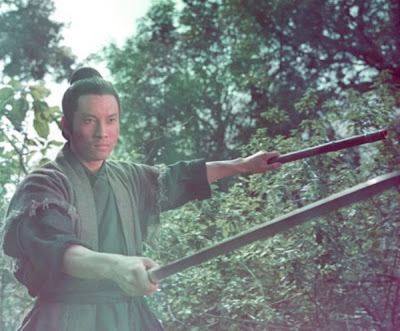 After an indoor brawl with Lee Wan Chung, Yueh Hua is interrupted by the flying daggers of Cheng Pei-Pei. The two have a stand-off outside with Yueh Hua perched on the top of a pole on one side of the river and Cheng Pei-Pei holding her sword on the roof across the way. It's a nice shot and a bit playful after the earlier bloodshed. Later that night, Yueh Hua spies the lovely Cheng Pei-Pei grooming, her long hair thrown over her face, and she pursues him outside through a skylight window just as the villains enter and shoot up the place with arrows -- seems they know who she is and why she wants revenge. After demonstrating her training at Da Kun Mountain -- hopping up onto the top branch of a tree, balancing on one foot, and killing a flock of birds with daggers mid-flight -- Cheng Pei-Pei stages a daring nighttime raid on the compound and just lays into her opponents. I guess the lack of a big budget and the production codes and mores of the time prevented this scene from being more gory but it's pretty brutal for this era of the Shaw brothers and a non-Cheng Cheh flick. Later in the picture, in a series of episodes with different tones, we see Cheng Pei-Pei masquerade as first a lute player, than a male martial arts hero, and then an old beggar in attempts to learn more about the gang she is seeking revenge on. Based simply on economy of story-telling and action delivered, Lady of Steel ranks as one of Cheng Pei-Pei's better wuxia films. Those films do tend to blur together in my mind but this one seemed a bit more enjoyable on my second viewing mainly due to the speed of the film -- and its short running time -- and the bits of comedy with Cheng Pei-Pei in her various disguises -- like a female, Chinese Inspector Clouseau! Unfortunately, Lady of Steel looks to be out-of-print on both VCD and DVD so there's no link to buy the disc this time.